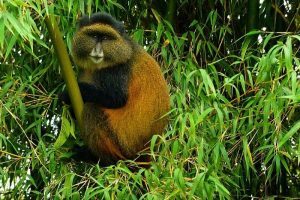 Golden Monkeys may not be the most well-known primates, but they are certainly one of the most enjoyable primates to encounter on your Uganda safari. These little creatures are worth visiting on your safari Uganda. These are small curious monkeys, golden in color and just like other primates, they love to scamper around the trees. Golden monkeys are estimated to be 3000-4000 individuals living in the bamboo forests of the Virunga Volcanoes. Researchers claim that they are still very much endangered as they face the same difficulties as their cousins the Mountain Gorillas found in Uganda, Rwanda and Congo. On your East Africa safari tour, you can only see these golden monkeys in Mgahinga Gorilla National Park; “Where Silver meets Gold”. It is the only park in the world where you can do a Uganda gorilla trekking safari and a golden monkey trekking safari Uganda. 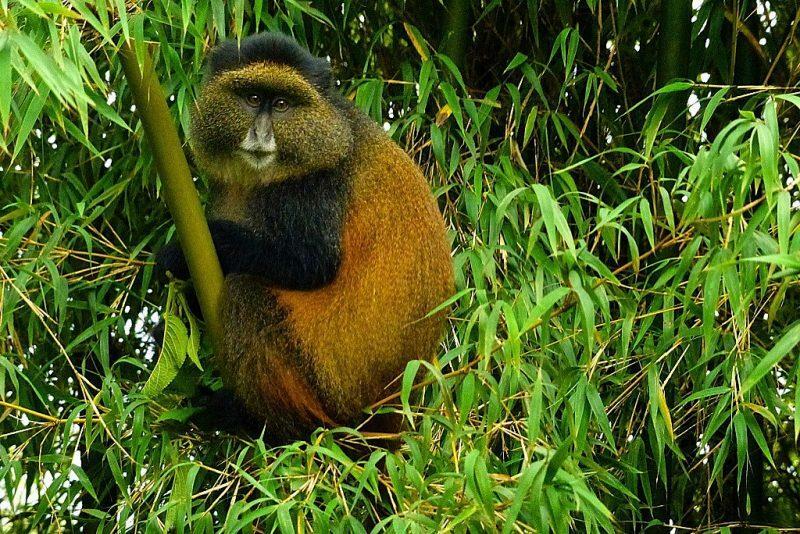 Other golden monkeys are found in Volcanoes National Park in Rwanda. Please note that while there is golden monkey trekking in Uganda and Rwanda, golden monkey habituation experience is only in Mgahinga National Park in Uganda. The Uganda Wildlife Authority now offers you the golden opportunity to experience a Golden Monkey Habituation safari Uganda in Mgahinga Gorilla National Park Uganda. Once given this opportunity, a tourist accompanies the researchers in the morning or afternoon to for a golden monkey trekking safari Uganda. You will have the unique chance to get close to these little primates and study their behavior in their natural habitat. A unique experience that will enhance your primate safari in Uganda! How long is golden monkey experience. Unlike Gorilla habituation & chimpanzee habituation experiences that take a full day, the golden monkey habituation experience is a four-hour activity and one can do it in the morning or afternoon. This involves engaging a Uganda golden monkey trekking safari experience in the forest with the ranger guides and researchers to learn more about golden monkey habituation. Golden monkey habituation experience permits cost $100 is booked at the Uganda Wildlife Authority head office. This process may be not be an easy one but contact Prime Safaris & Tours Ltd for more details about booking your permit before you go for your adventurous golden monkey habituation in Mgahinga National Park Uganda. What is the minimum number for golden monkey habituation experience. Unlike golden monkey trekking that has no minimum numbers, golden monkey habituation is limited to only six people to see these monkeys either in the morning or afternoon. Still in this park, you can enjoy a Uganda gorilla safari tour, a cultural safari, a Uganda birding safaris or go out for a Uganda wildlife safari.